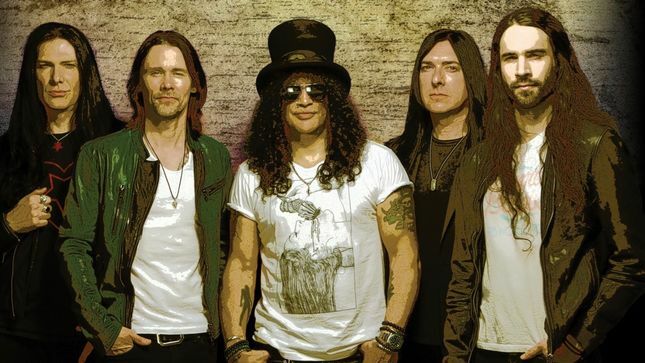 Slash featuring Myles Kennedy And The Conspirators have announced dates for a summer tour of North American in support of their latest album, "Living The Dream." The band will begin the 17-show, month-long series in San Francisco, CA on July 15, hitting several major Canadian markets along the way before it wraps up in Orlando, FL in mid-August. A fan-club pre-sale starts Tuesday, February 5 at 10 a.m. local time (password is "SLASH19"), with general public tickets going on sale Friday, February 8 – times vary by market so check with your local ticket provider for details. Produced by Michael “Elvis” Baskette (Alter Bridge, Iggy Pop, Incubus), “Living The Dream” debuted at No. 27 on the US Billboard 200 upon its release last fall. The project marks Slash’s fourth solo album and third with his band featuring vocalist Myles Kennedy, drummer Brent Fitz, bassist Todd Kerns and guitarist Frank Sidoris. Slash and the band have been playing shows across the Far East, Australia and New Zealand in the past month, and will begin a European tour in Offenbach, Germany on February 7.